Achieve fortune and glory in THQ Wireless' addictive puzzler. At first, the death defying Indiana Jones didn't seem like a good fit for a puzzle game, but THQ Wireless pulled it off with the iPhone App, Indiana Jones and the Lost Puzzles. The famed archaeologist travels to different ruins in search of fortune and glory. Along the way, he must contend with spikes, falling platforms and even his worst fear, snakes. It's easy to grasp, incredibly entertaining and visually stimulating. Even better, it only costs $3.99. Lost Puzzles' designers toss Indy onto a grid comprised of tiles. Your goal is to make these tiles disappear before time runs out. To do this, you link three or more of the same color by hopping onto them, achieved my simply touching the desired tile. Tiles come in various colors (blue, orange, green, tan) and you also have Joker bonus tiles that help you complete a chain. So, for example, if you previously jumped on two blue tiles, hitting the Joker tile will make all three vanish; you can link as many tiles of the same color as possible. Naturally, the game's a bit more complex. Whenever you jump onto a tile, the game determines which tiles you have access to next. They could be the ones right next to Indy, or a tile several feet away (select that one, and he'll swing across with his trusty whip). In addition, THQ Wireless throws hazards onto the playfield, including spiked tiles and snakes. Land on those, and it's game over. On top of that, some puzzles come with a series of conditions. One may ask you to remove 12 of each colored tile before the clock expires; fail, and the ground gives way. Nemesis puzzles, meanwhile, force you to avoid a specifically colored tile or face the consequences, while Hot Potato changes the desired color randomly. Finally, there's Ruins of Adventure, a mode that gives you the opportunity to choose one of two puzzle types at a time, the goal to find a set of jewels before moving on to the next location. It's great fun, especially when combined with the stellar presentation. Visually, the game's quite attractive, with the multicolored tiles, ancient ruins in the background and Indy jumping all over the place. As for audio, THQ Wireless licensed the original Indiana Jones theme music for the title screen, but went with its own tracks during actual gameplay, none of which match John Williams' epic score. On the positive side, that's the game's major weakness. Another issue is Lost Puzzles' stinginess. During one specific puzzle, we needed to eliminate blue tiles to proceed, but the game wouldn't give us enough, and when it did, the computer put them in the most inconvenient locations. It's akin to needing a certain piece in Tetris, only to never receive it and fail. That, however, doesn't mar an otherwise stellar effort from THQ Wireless. 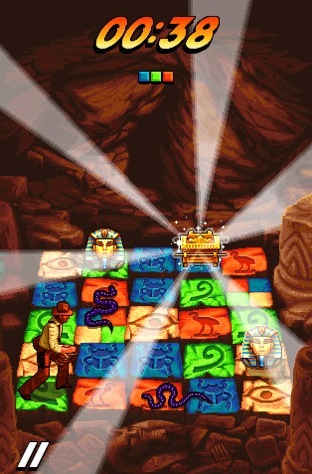 Indiana Jones and the Lost Puzzles is a cool and affordable brainteaser that'll keep you busy for hours. Download it immediately and find the lost Ark. Just don't let it melt your face. 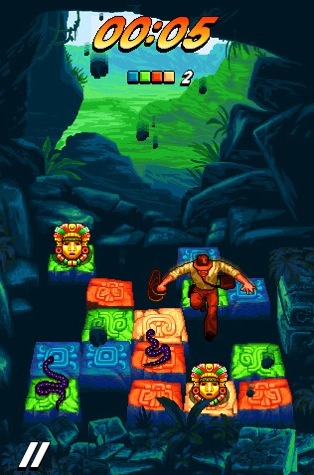 What's Hot: Lots of different puzzle types, familiar Indy theme music, colorful graphics, lots of treasure to collect. What's Not: The computer doesn't always play fair, only one licensed song.